LUCY BURDETTE: I had an email exchange with our Red Writer friend Keziah Frost a while back, and she was mentioning how different (and how much harder) the experience of writing the second novel was, as compared with the first. (Have you read THE RELUCTANT FORTUNE-TELLER? It's a perfect summer book...) And I said, "this would make a great post." And she said, "I'll write it." So welcome Keziah! When I am not writing novels, I am a psychotherapist. These two jobs are not as different as they might seem. After all, in both cases, it’s all about the story. What that means is that we have a tendency to look at another person’s made-up, dressed-up, prepared-for-public-consumption version of herself and then look at ourselves on our worst day and think, I just don’t measure up. That, right there, is what your therapist would call a “cognitive distortion.” In other words, it’s a mistaken idea. You see, I easily and giddily wrote my first novel, The Reluctant Fortune-Teller. I laughed out loud as I wrote. And what did I write? Why, I just went and wrote the book I wanted to read, that’s all. (I’d heard that advice, and it sounded good to me.) What could be easier? And, because the stars aligned, a wonderful agent agreed to work with me, and then HarperCollins/Harlequin/Park Row published it, much to my eternal gratitude. I was too naïve to worry about anything at any point in the process. And then it was time to write novel number two. However, now, I was a different writer. I had learned many things I hadn’t known when typing away about Norbert, the retired accountant who is forced to become a card reader to make ends meet. The first time, I was unaware of all that lay ahead of me: the editing process, the self-promotion, and the necessity of getting and staying plugged in to social media. I was unaware of how many zillions of books are published every single week. I hadn’t started trying to read all of them, so that I would know what readers liked and publishers bought. In short, the first time, I was wrapped in a cocoon of blissful ignorance—and that ignorance protected my creativity. I was too innocent to compare my insides to anyone else’s outsides. Fast forward to my current work-in-progress. As I began to write a humorous mystery, I studied the best I could find in the genre. I made the mistake of comparing finished, published, celebrated works with my first rough draft. Of course, I began to feel a crisis of confidence. It took me a few months, but now I get it. Don’t compare your insides to someone else’s outsides. And don’t compare your rough draft with someone else’s published work! Every novel you love began with a rough draft, and was polished and perfected before you laid eyes on it. Obvious? Yes. Easy for a new writer to forget? Absolutely. So now, I ‘m back to where I started: having fun, making myself laugh as I write, and making another book I would love to read. There will be work ahead, polishing, and perfecting. That’s all part of the fun. I think that as much as possible, writing—and life--should be fun. As writers, and as livers of life, we do so much better when we don’t take ourselves so seriously. All of us—writers and other human beings-- need to quiet that inner critic, and set ourselves free to play. No one else can tell your story. How about you? Do you have an Inner Critic to manage? How do you keep your Inner Critic under control? And what do you do to make sure that you keep on having fun? ::sigh:: I have not yet figured out how to keep my Inner Critic under control. But the fun part is easy: lots of books to read and lots of time spent with grandchildren . . . .
With my therapy clients, I actually do a guided imagery exercise for this: inviting the Inner Critic to come forward, and taking a good look at him or her--then either shrinking him down to the size of an ant or shoeing him out the door and locking him out. We have got to stop picking on ourselves and have more fun! Great advice for writing and living, Keziah. Now, I'm trying to figure out why I haven't read The Reluctant Fortune Teller yet. I just clicked over to Amazon and ordered the paperback of it, so I should be correcting that soon. And, I went to your blog to take a quick look at the Norbert's Readings. Such a clever idea. I'll be going back and reading those a bit later. Does the second book you're working on feature Norbert, too? Kathy, your post warms my heart!! Yes, it was fun to write the blog posts where my fictional character Norbert reads cards for real people, such as Lucy Burdette! Funny you should ask, Kathy, about a second Norbert book. It is completed and sitting on my desktop, waiting for some future opportunity. In the meantime, I am writing the first in what I hope will be a series of humorous mysteries! I love that saying. Much easier said than done, but it's still a great reminder. And your book looks like so much fun! Thanks, Marla. Why, oh why, are so many things so much easier said than done. *sigh* Yes, The Reluctant Fortune-Teller is meant to be fun--and encouraging--for readers! Such wise advice: Don’t compare your insides to someone else’s outsides. And don’t compare your rough draft with someone else’s published work! Hahahaha! I'll write that one on a scrap of paper and add it to the other scraps taped to my wall above my laptop! 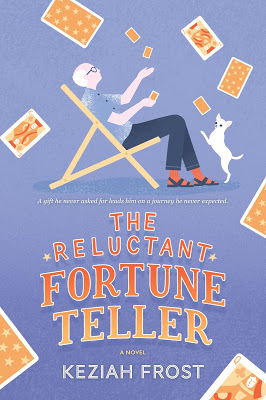 I loved "The Reluctant Fortune Teller," Keziah, so I will certainly put your next book on my list to watch for. No pressure. I think, if you just keep on writing the books you want to read, you'll be fine. I am tempted to say that, being practically perfect in every way, I don't have an inner critic, but that, of course, if "Outside Me." "Inside Me" knows that the house is a mess, I don't get enough sleep, and I have no House Beautiful decorator gene, so I have to be careful not to compare my life with my friend-who-shall-remain-nameless and her historic showplace of a house. But then my friend will call and tell me all her struggles and it will all be okay. I think having a good friend you can be honest with, who is honest with you, can be a tonic for many kinds of blues. Gigi, I am thrilled, truly, to know that you loved The Reluctant Fortune-Teller! You know, I just saw a production of Mary Poppins, so when I read that you are "practically perfect in every way," I heard the song version! I agree completely: we need supportive encouragers in our lives. That's why I reached out to Lucy Burdette when I was going through angst about my rough draft. Such conversations keep us going! Gigi, I suspect your friend spends a lot of time worrying about how shabby her house is, and all the things that haven't been done thereof. It's all relative, you know, and friends none of that matters. Ooo, cool, Lucy! I can claim that the dog hair collections are curated decorative accents? I'm on it! I have a sign that says "Dogs are people, too." I just heard something about India declaring that henceforth dolphins are to be considered "non-human persons." I think many of us can understand this. This is actually great advice. Thank you for sharing it. I am now on #5, closing in on the end of the first (but already much revised) draft. And it doesn't get easier. Some parts are easier- you know how to do more and do it better - and some are harder - because, because, because. Triss, and do you also find that there are days of flow, and fallow periods (oh, I am mixing metaphors). Sometimes you're just on a roll and everything works. Other times...not quite so much? Keziah, I think "write what you want to read" is much better advice than "write what you know." And we need more humor--so off to find Norbert's readings! We really do need more humor! I am reading The Rosie Project right now and laughing on almost every page. I love books that make me laugh. And I do hope that Norbert's story makes you laugh! Keziah, I'm delighted to know of your previous book and also the new series-starter that you are writing. Love finding new books, authors, etc. As to your advice, it's so very wise. Don't we all have that inner critic (or as I call her - the horrible little hag that lives in my mind)? I've tried to shush her or, may I say it, 'kill' her creatively (ah, that's why I read crime novels! ), so far she still rears her ugly little head. I'm working on it though. Now, I'm off to take a look at your blog and Norbert's 'readings'. Don't you find that most of us are much too hard on ourselves? Keziah, I was happy to see your post today because it reminded me that every time I have tried to get The Reluctant Fortune Teller from the library, the wait list was so long it discouraged me. Prior to writing this post I logged on and found, finally, no wait list. I will be reading it by the weekend -- I have heard SUCH good feedback about it! Well! My heart did 3 somersaults reading your message! You really wanted to read my book-oh! The library had a very long waiting list for it--oh! oh! And now you are going to read it- oh! oh! oh! Reader feedback is vitamins to a writer's soul. Oh, my gosh, writing The Second Novel was the worst. Like you, Keziah, I wrote my first in a cloud of blissful ignorance - about the publishing industry, promotion, critics, etc., etc. My debut received a great deal of attention and several awards, which sounds wonderful - it WAS wonderful - but when I sat down to manuscript no. 2, I had NO idea what I had done to make the first book worthy of praise. I spent the entire time up to and after publication day convinced the novel was going to fall flatter than a pancake and I would have to go back to being a lawyer. It didn't, of course, and I didn't (thank God!) but I'll never forget that serving of humble pie. Wow! It really helps to know that this struggle is universal. And I can tell you just love being a writer (and not a lawyer)! Before I finished reading this blog post I went and added The Reluctant Fortune Teller to my Nook queue. It's been on my wish list for awhile, so thanks for the nudge! Great advice, Keziah. Self-criticism is really useless and crippling. I love the idea of showing him or her to the door and locking the culprit out! Great imagery. Karen, "great imagery," indeed: I think we read books in part for the imagery we can create in our minds, along with the author. Sort of a co-creation. And imagery can be so effective in healing us, in stimulating our minds, in showing us another way, another world.... Please let me know what you think when you read The Reluctant Fortune-Teller! Great advice. I was fortunate to write the first two books in that cocoon because it took so long to find a publisher. But this is why every time I hear a published author say they have self-doubt when starting the next book, I say, "Okay. Not just me. Onward!" Yes! The cocoon is a good place to get a lot of work done! Once you have been published, you have to learn how to shut out concerns about what the world will think, and get back to that place where it was just you and your characters. It really is good to hear from you, Mary, and know that this is all part of the glorious process! You know that I loved the Reluctant Fortune Teller, Keziah. So I'm sure the next novel will also be great fun . Thank you Rhys! I am honored to know that! You are an amazing role model for me. Keziah, I bought The Reluctant Fortune Teller but have yet to read it--must move it up in the queue!!! Luckily for me, I had written a good bit of novel #2 when I sold #1, and finished #2 and started on #3 by the time #1 came out to some very nice critical response. HOWEVER, every novel since has felt like a second novel to me. I second guess myself into paralysis. "This was a horrible idea, no one will like it, why did I ever think I could write." The only time I don't feel like this is when I am actually WRITING. And when the book is finished and polished I usually like it a lot. So it's a pretty simple equation--write, don't think about writing. You'd think I'd have absorbed this by book #18! Deborah, I find it fascinating that this is a repeating pattern. So your advice is, write, don't think about writing. Yes! In my therapy office, I have a little handmade sign that says, Decide what you want; do what it takes. Sometimes introspection is the devil! Sometimes, when Deb gets stuck, she asks my advice. My response is generally, "Is there anyone else you can kill?" The truth is, she doesn't need my advice, and always comes up with ideas that everyone will like. Yes, it's awful what writers do to characters, isn't it? I'm about to plunge my protagonist into hot water, and she's such a nice person, too. Where is this Norman fellow? I think I need him! I'm a quite happily recently retired person, but earlier this morning I thought to myself that I'm not being very productive these days. I compared myself to my mom, who was somewhat younger than I am when she retired. Then it occurred to me that I'm a different person(duh!) and oh, yeah, I'm taking classes at the senior center, I volunteer at the library, and I'm always relaxed these days. I must be doing what I'm supposed to be doing! Now I must put looking for Norman on my to do list for today! Oh yes, I think Norbert will have some tidbits of wisdom that will tie in very nicely with your current thinking! Let me know how you get on! Thank you for this reminder, Keziah! I'm not sure it ever gets easier, but becoming aware of the process and our own patterns may help. When I'm struggling, I try to remind myself that it happens every time and I get through it! Can you tell us the origin of your name? It's lovely and unusual! You, too, Ingrid? It really is looking like a universal phenomenon! The origin of my pen name? (Keziah rhymes with Mariah, by the way.) Well, when I was about 13 and living in New Jersey, I used to love to visit a very old cemetery. The tombstones there went back to the 1700s. I was fascinated, because there were lots of children there, and because a lot of the stones had little narratives on them about the person. I spent so much time getting to know their stories, I almost felt like I knew these people. And one name that stayed with me was "Keziah." Apparently it was common then, along with Hezekiah, Uriah, etc. So when I chose a pen name, I picked it. For a last name to accompany it, I needed something short, simple and literary, something that created an image. So there you have it: Keziah Frost. Thanks for asking! Is Ingrid Thoft your real name of a pen name? It is a perfect name! It's my real name I love the origin of your name! Norbert/Norman-- I got the "Nor" part right. Sorry about that! That's ok! It even happened in a professional literary review once!